Materials engineering – the precise deposition, removal, modification and measurement of materials at the atomic level – has enabled innovations in the Electronics, Display and Energy industries, and led to transformative changes across the globe, dramatically improving the quality of life and creating exciting global industries. In the next 50 years, we will see even more radical innovation as we bring together the digital and physical worlds through materials engineering. This will enable next-generation integrated circuits, displays and advanced sensors, while simultaneously laying the foundation for revolutions in Artificial Intelligence, AR/VR, Transportation, Digital Manufacturing and Healthcare. This presentation would detail the role of materials engineering technologies in creating a world of abundance by addressing critical problems in AR/VR, Artificial Intelligence, Big Data, Transportation, Digital Manufacturing and Healthcare – through technological creativity, entrepreneurship, open innovation and partnerships across the ecosystems. 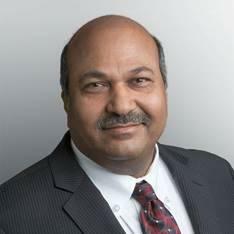 Dr. Omkaram (Om) Nalamasu is Senior Vice President and Chief Technology Officer (CTO) of Applied Materials, Inc. and President of Applied Ventures, LLC, the venture capital fund of Applied Materials, where he oversees investments in early- and growth-stage companies. A world-renowned expert in lithographic materials and one of the semiconductor industry’s foremost forward-thinkers, Dr. Nalamasu has championed a renewed focus on Applied’ s global innovation culture through various internal development programs and open innovation methods. He has developed strategic relationships with universities, government organizations and research institutes around the world. Dr. Nalamasu joined Applied in 2006 after serving as an NYSTAR Distinguished Professor of materials science and engineering at Rensselaer Polytechnic Institute, where he also served as vice president of research. He has held key research and development leadership positions at AT&T Bell Laboratories, Bell Laboratories/Lucent Technologies, and Agere Systems, Inc. He has received numerous awards, authored more than 180 papers, review articles and books, and holds more than 120 worldwide issued patents. He is a member of the Singapore’s A*STAR (Agency for Science, Technology and Research) Board of Directors, Singapore’s International Advisory Panel for Advanced Manufacturing and Engineering, and the board of directors of The Tech Museum in San Jose, California., Dr. Nalamasu was elected to the U.S. National Academy of Engineering. He received his Ph.D. from the University of British Columbia, Vancouver, Canada.